WHY IS THE BAHAMAS NOT A PART OF THE U.S.? I mean, seriously, the endless isles, cays, banks and bays are scattered so tantalizingly close to Florida that it seems a minor miracle that at least part of what is now the Bahamas was never integrated into a full possession of the United States. The answers are there. Anyone can dive headfirst into the Bahamas wikipedia entry and see why. Colonel Andrew Deveaux, a loyalist to the British Crown, recaptured Bahamas from the Spanish in the late 18th century. 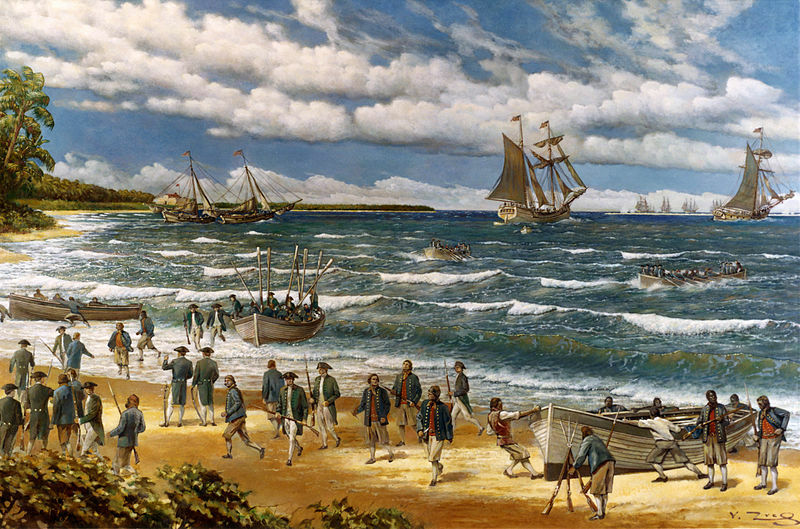 The year was 1782 and the reeling British were losing the fight with the American colonists. However, Bahamas would become a haven for those loyalists looking to escape condemnation in the newly created United States (the relatively sparsely populated islands had already been home to a small British population that had migrated from Bermuda). It was just six years earlier that the U.S. tried to capture the Bahamian capital, Nassau, for itself. The lesser known “Battle of Nassau” was actually the first foray into battle for the then named “Continental” Navy and Marines. Yes, you got that right – our Navy’s first action was on the beautiful beaches of the Bahamas. In fact, Fort Montagu, the fort that the Navy and Marines raided over those two weeks of “occupation” is still standing and can be toured anytime when you get sick of sitting in the pearly white sand or soaking up the clear turqoise waters. The Navy again raided Fort Montagu under Capt. John Rathbun in 1778, but this would be the last of the the American threats on Bahamian soil (er, sand). The Spanish gained control of the islands for a short while before, as mentioned, they turned back to British rule under DeVeaux. The Bahamas served as nothing more than an arms raid by the Americans – but it’s worthy to take note of how little the Bahamas were threatened by such a close neighbor. Roughly 10% of Bahamians today are of European descent while the great majority of the rest descended from Africa, jolted from their original homes during the period of heavy slave trading. In fact, many slaves sought refuge (along with the Crown loyalists) in the Bahamas. Today the Bahamas can very much be compared to Canada in its political relationship with the United Kingdom as they both reside under the Commonwealth, with Queen Elizabeth II the reigning monarch. It’s interesting to note that Key West lies about 60 miles from the edge of the Florida mainland at Cape Sable (in the unpopulated Everglades no less). The space between Miami Beach to Bimini Island, the westernmost Bahamian island, is roughly 50 miles. In fact, setting out 64 miles from the shores of West Palm Beach will get you to the edge of Grand Bahama Island, home to the popular destination of Freeport. It’s really amazing that, with such short distances, the Bahamas managed to mostly shield itself from an American (or, for that matter, Spanish) takeover. There’s even a ferry service to Grand Bahama from Fort Lauderdale – the only ferry I know of that connects the U.S. with another country outside of the ferry services to Canada (a ferry from Tampa to Mexico has been discussed). There has been talk of the same ferry provider offering service to the even closer (but less touristy) Bimini, but these plans have yet to come to fruition. Despite its British link, the Bahamas are easily visited the most by American tourists. British Airways does offer an expensive non-stop route from London direct to Nassau (can be found now for around $1,200+ USD). Compare that to the U.S., where round trips to the capital city generally range from $200-$400 depending on where you live. It’s nice to see a direct flight is provided for U.K. customers, though. Outside of those living in Hawaii, direct flights to the U.S. territories of Guam, Northern Mariana Islands and American Samoa are generally only reachable through great expense and travel time for the American tourist. Just plain lucky I guess !! Oh yes. Yes indeed. By way of Infia, I hear.